Down at the farmers market at Kapi‘olani Community College, Ken Love and I watch people file through his avocado-tasting booth. Under the canopy, there’s a cornucopia of avocados. Love has lugged in more than 300 pounds of them from the Big Island. The avocado mavens quietly sample each of five varieties heaped in bite-size chunks on paper plates. One by one they solemnly taste each selection, savoring them like oenophiles. They take their duty seriously—nothing focuses one’s attention like a free sample—and some have to make two or more passes through the line before they reach any conclusions. While we watch, I hold forth on the intricacies of building the perfect sandwich—a life’s work. I’m preaching to a choir, of course. Love nimbly palms his pipe and chimes in with the chorus. “Yes, but those supermarket Calavos—they’re pretty much tasteless,” he says, referring to the ubiquitous California-grown varieties typically on offer at supermarkets. The irony, of course, is that Hawai‘i is the world capital of gourmet avocados. Love, the vice-president of the Hawai‘i Tropical Fruit Growers Association and an officer with the Hawai‘i AgriTourism Association, knows this better than anyone. 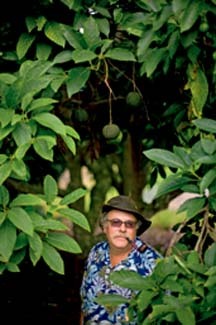 For more than twenty years, he tended his own diversified Kona farm, 13 acres of coffee and tropical fruit trees—including a grove of avocados. Gradually he became disaffected with coffee (“I was suckered into the coffee thing by a real estate agent,” he says) and began concentrating on the tropical fruits. Three years ago he sold his farm to devote himself fulltime to projects like this—promoting Hawai‘i produce and persuading Big Island farmers to experiment with new, more profitable crops. Hawai‘i’s neglected avocado has become his particular bugbear. He’s written papers on the industry. He’s canvassed and counseled the growers. He’s scolded and pleaded with and nagged the wholesalers and grocers. Now, as the self-appointed spokesman for the Hawai‘i avocado, he stuffs his pipe into his pocket and begins a well-rehearsed lecture. “Over 200 varieties of avocado trees grow in Hawai‘i,” he says, the result of three centuries of traders who ate avocados on their westbound passage from Mexico and Central America, saving the seeds of the ones they liked. Those seedlings flourished here, and local farmers—many of them Japanese coffee planters—grafted and cultivated the best varieties. Even today many of the local avocados carry the Japanese names of Kona coffee growers: Nishikawa, Yamagata, Ohata. “We have all three races of avocados here,” Love says. “We have West Indians, like the Malama, with smooth skin and large fruit; we have Guatemalans with hard, pebbly skin, like the Hawaiian Hass; and we have small, thin-skinned Mexicans, like the Linda.” With that diversity come advantages. We have varieties that grow at different altitudes and microclimates and trees that fruit at different times of the year; so, in theory, Hawai‘i growers can produce avocados year-round. Love presides over the operation with a kind of rumpled aplomb. He hasn’t always been a farmer (he spent thirty years traveling the globe as a photographer for Associated Press), but he certainly looks the part. Beneath his floppy hat, he’s red-faced and jowly and sports a Brillo-like mustache. He wears old, scuffed boots and faded jeans that hang loose beneath a modest paunch. Nevertheless, the overall impression is of a thinking man. Leaving the details of the booth to the volunteers, he stands out in the sun, answering questions about avocados and making pronouncements on the proper role of agriculture in society. With his eclectic interests and contemplative cast, he reminds me of Jefferson’s farmer-philosopher. For my part, I take a scientific approach to the taste test. Systematically, I take at least three bites of each variety—one for consistency, one for flavor and the rest to accommodate my basic greed. By the end—three passes through the line, in my case—I reach the inescapable conclusion: All five varieties are outstanding. Three of them—the Malama, the Kahalu‘u and the Linda—are the three best avocados I’ve ever eaten. Each different, each flawless. I begin to understand the extent of Love’s frustration that Hawai‘i’s superior avocados are unsung, unknown and, unless you have a tree nearby, mostly unavailable. Of course, marketing 300 kinds of avocadoes is impossible. There’s just too much variety. Even Love has a hard time keeping them straight. There are big, nutty Murashiges and Yamagatas, which are great for salads. The fruity Yamanes and Beshores are suited to dips and guacamole. The issue is further clouded by hundreds of wild avocadoes—the unnamed varieties and accidental hybrids found in people’s backyards and escaped into the forest. Typically these are inferior fruit; the great ones are quickly shared among friends and farmers. Thus, the vaunted diversity of Hawai‘i’s avocados actually works against them in the marketplace. “People don’t know what they’re buying,” Love says. Although you’ll occasionally find a few local varieties at a farmers market, you’re unlikely to find them at the supermarket. Even grocery stores with local roots, like Times and Foodland, rarely offer Hawai‘i varieties; at the national chains like Safeway and especially the big-box stores like Wal Mart and Costco, the avocado bins are full of imported fruit. “Last year,” says Love, citing a 2007 study he helped to organize, “Hawai‘i farmers produced over 800,000 pounds of avocados, but nearly half of that went to waste.” It’s not for lack of avocado consumers, he points out. While more than 350,000 pounds of prime avocados rotted on the tree here, Hawai‘i’s supermarkets and wholesalers imported 1.5 million pounds of avocados from California and Mexico. “Currently, grocery stores only pay 60 to 80 cents a pound for local avocados, but they pay $2.30 for the California Hass,” Love says. Sometimes the local varieties retail for less than the wholesale price of the California avocados. Thus the wastage: For many farmers it’s not worth the effort to harvest local avos. Besides, few are actually avocado farmers; they’re coffee or macadamia nut or tropical fruit farmers who happen to have a few avocado trees. This is all madness, of course, spending top dollar for an imported, inferior fruit when you have a veritable orchard in your own backyard, but Love has his work cut out for him if he wants to make sense out of Hawai‘i’s avocado market. Despite their superiority, there’s a built-in prejudice against local avocados; grocery stores want the consistency and predictability—both in look and supply—of the California avocado. Never mind the quality. Export isn’t an option either. “This year is a centennial of a sort,” Love says. “Back in 1908, the California growers got the Hawai‘i avocado banned. For the fruit flies, they said.” There are treatments for the fruit flies, but they’re not economical for Hawai‘i’s small-time producers. Now and then there’s a quiet movement to lift the ban—at least for the cold, northern tier states during the winter, when fruit flies pose no threat to agriculture. Love isn’t hopeful, though; the big California producers will never let it happen. Instead, he focuses on persuading local markets to change their buying habits.